Long burn R-27ET1 heatseeker variant under the wing of an Su-35 demonstrator. Note larger diameter dual pulse motor section (KnAAPO). This one Grisha’s ‘Shoot-Off’. I think Sukhoi win air combat with new missile engineering from Vympel comrades. Looking at tactics to defeat incoming AIM-120D. Have a new active radio locator self guidance head [Ed: seeker] for R-74 – scaled down from R-77M. 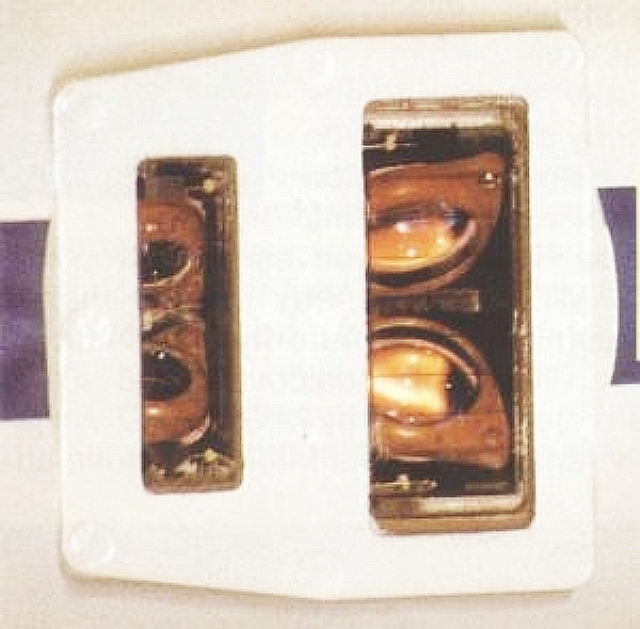 Use helmet sight linked to OLS-35 [Ed: electro-optical system] to point to hot AIM-120D. 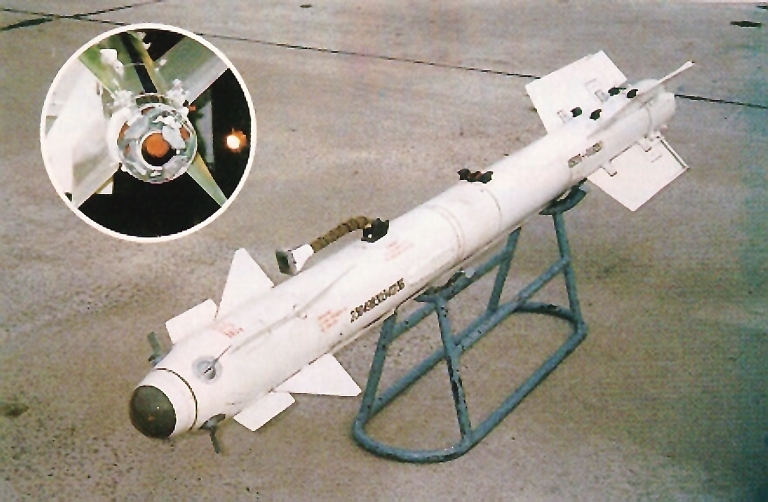 Fire two R-74 – one IR, one radar, against AIM-120D. R-74 pulls 90G, AIM-120D only 30G, so Grisha thinks R-74 kills Amerikanski AIM-120D. Agat's 9B-1103M-150 active radar guided seeker is a repackaged derivative of the 9B-1348/9B-1103M seeker family originally developed for the R-77 RVV-AE and R-27EA. It has been reduced in diameter to fit the R-73/74 Archer family of missiles, at some expense in acquisition range due to the ~2.5 dB reduction in antenna gain. It weights 8 kg and can acquire a 5 m2 target at 7 nautical miles (Agat). Also some bad news for AIM-120D - physics says Su-35 can outturn the AIM-120D. Mathematics here is a bit tricky, but works like this. Missile must follow track of turning aircraft, and G force in a turn is square of true speed. After firing from Mach 1.5, slow to Mach 0.95 and descent to 12,000 metres – this about 900 kph and good turning speed for Sukhoi. AIM-120D rocket second pulse burning push speed up to about Mach 3.5. Ratio 3.5 / 0.95 = 3.7 which squared is 13.5. So AIM-120D must pull 13.5 times G bigger than Sukhoi. Some say biggest possible G of AIM-120D is 30, so divide by 13.5 and get Sukhoi to pull only 2.2 G to outturn AIM-120D. This is very easy I think (Refer http://www.hochwarth.com/misc/AviationCalculator.html). Apologize for some more mathematics. Say AIM-120D lights seeker at 20 km, missile closing at 3,700 kph. So, takes 20 seconds to reach Sukhoi. Radar Warning Receiver (RWR) tells direction of incoming missile, so Sukhoi turns to put missile in rear quarter and starts high-G, jinking barrel roll more than 2 G. I think closer to 5G. Sukhoi has thrust vector jets [Ed: TVC nozzles], so turning at 5 G for 20 seconds no problem. Missile cannot track barrel roll, so fly past and loses lock. Even Tom Cruise thinks tactic is good! Comrades ask Sukhoi engineers to write software for flight controls computers to avoid Amerikanski missile. Arm system, and when OLS-35 or RWR see incoming missile, audio horn sound and Sukhoi fly itself on missile avoiding path. Not much comfort on pilot, but better comfort as having AIM-120D blow up cockpit. Fly all air dominance missions with KEDR towed decoy, so if AIM-120D has lucky crossing, maybe fly after decoy instead. Also have new wingtip pods for radio electronic combat [Ed: Electronic Warfare] which twist phase of radar wave around [Ed: Crosseye jammer for phase front deception] so Amerikanski single pulse [Ed: моноимпульсная антенна – monopulse antenna in AIM-120D] tracker confused . Comparison of notional R-74-PD against existing R-74 Archer and R-27 Alamo airframes (line drawings C Kopp). Maybe Chuck also work out that BVR missiles can be outturned and copy Sukhoi tactic. Now we close to 'eyeball distance' and shoot 'dogfight' missiles – Sukhoi shoot R-74 and Super Hornet shoot AIM-9X. Mad-dog missiles in air from both sides, maybe get Mutually Assured Destruction – MAD air combat. Not so good for pension I think. Grisha thinks this is good news. Best of both worlds – long range missile shoot, put mad dog missile close to Chuck long way from his missiles. Vympel man say R-74-PD have quick burn to clear R-27 booster, then slow burn to Mach 2.5. Good for tail chase if Chuck turns and runs. More Mathematics. Chuck doing 900 km/hr and Mach 0.85 at 10,000 meters. R-74-PD doing 2,700 kph, speed ratio is 3, so missile need to pull 9 times G Chuck pulls to beat missile. So, if R-74 PD can pull 90G, Chuck needs to pull 10G to duck Archer shot. This very hard for slow Super Hornet and JSF pidgeon. Grisha make this challenge to Amerikanskis. We have ‘Russki Roulette’ fry-up and shoot-out in same mission. Even give Amerikanski first AIM-120D shot at Grisha to see if Grisha can duck missile and live. Then Grisha fire R-77M and R-74-PD at Amerikanski see if APG-79 or APG-81 can fry Adder and Archer. I think Grisha win this one – boom boom! So, bottom line is Russki engineers and pilots think about coming air war and work together. Very important this. Now have sensors, missiles and tactics working together in big aircraft to dominate future air combat war. So long Chuckie! The claimed development or indeed existence of the 'R-74-PD' two stage hybrid BVR combat missile cannot be verified easily via open sources since there have been no disclosures to date in the Russian press. The evidence is at best 'anecdotal'. Air Power Australia will therefore not speculate on whether this missile exists, is in development, or is merely a boastful claim on the part of a Russian missile industry executive. 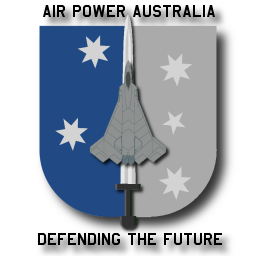 What Air Power Australia can do is comment on the technical feasibility of such a weapon and its likely performance in an operational environment. As Colonel Medved points out, Russian industry has used two stage missile designs before for air launched applications. 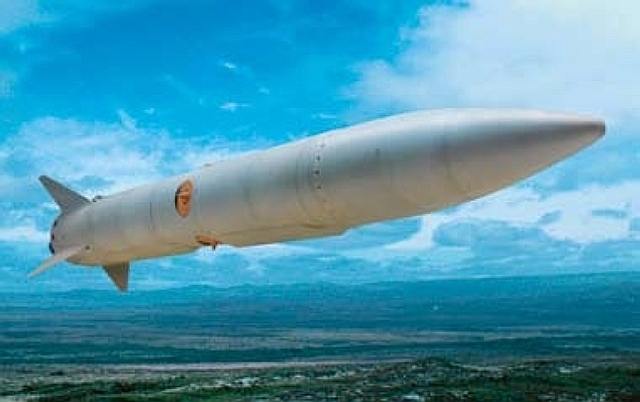 The 3M54AE air launched variant of the Sizzler ASCM is an example, with a Mach 3 rocket propelled terminal stage mated to a subsonic cruise missile airframe as a midcourse stage. 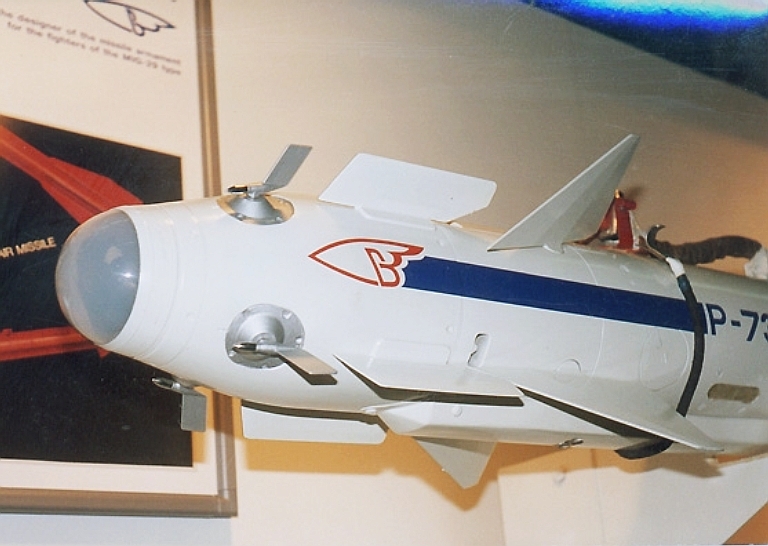 Vympel have also experimented with reverse firing variants of the R-73, specifically the two stage R-73R equipped with a booster pack to cancel the momentum imparted by the launching aircraft when firing the missile backward. Therefore the experience required to produce a two stage missile of this ilk exists in the industry, and specific experience exists on mating the R-73 airframe to a booster stage. The long burn variants of the R-27 Alamo have a dual pulse motor and a range of different seeker heads, and are credited with a range of around 70 nautical miles against a closing target, using the legacy analogue seeker package. Range performance for the optimised digital 9B1103K series seeker has not been disclosed. This missile is widely deployed with Russian units and has been exported in the semi-active radar homing and heatseeking variants. As a result there is a large warstock available and the missile remains in production. The R-74E is the production designation of the new K-74E "digital Archer" with a redesigned seeker package, and it is the most lethal short range missile developed by Russian industry to date. It employs a high off-boresight capability gimballed seeker and thrust vectoring to provide a very high G load capability and thus high lethality in close combat. To date the missile has only been shown in the heatseeking variant equipped with the MK-80M series scanning two colour seeker, but a new MK-2000 gimballed seeker was in development. Agat recently developed the 9B1103K-150 which is a repackaged "small bore' variant of the R-77 AMRAAMski's 9B1348 series active radar seeker, sized for the Archer airframe. The seeker includes Fibre Optic Gyro (FOG) inertial unit, a digital processor (using the US TMS320 chip in later variants), and a planar array monopulse antenna. All of the technology to build the 'R-74-PD' therefore is available. The question is how would such a missile have been integrated, and what is its likely performance if it indeed exists? The long burn Alamo is viable as a booster stage to carry a terminal kill stage into the acquisition box of a target. The missile has a launch weight of around 750 to 780 lb in the R-27ER1/ET2 variants, and uses the "butterfly" canard surfaces for control, with fixed tail surfaces. A boost stage derivative would have to retain some shortened configuration of the control section as this is required to mount the midcourse control surfaces and actuators, the main battery, the midcourse guidance computer and the datalink receiver. How long this section is will depend on the design employed and whether newer or legacy components are used. This configuration would allow the launch aircraft to shoot this missile off the standard R-27 AKU-470 ejection unit/APU-470 launch unit using standard umbilicals and existing radar software for midcourse steering commands. 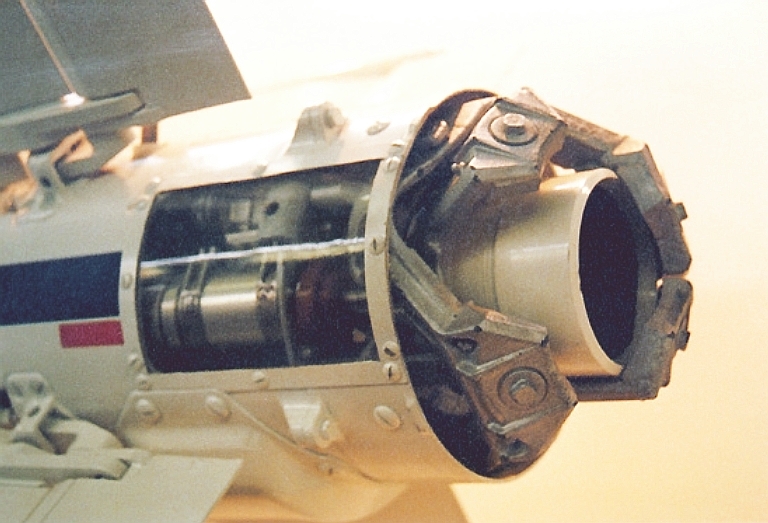 Interfacing any variant of the Archer to such a boost stage will require some arrangement to provide structural stiffness and a protected interface to the Archer's umbilical port to provide an emulation of the aircraft interface, including thermoelectric cooler drive for the infrared seeker variants. The simplest arrangement is likely to be a strongback rail over the R-74 airframe which is joined to an adaptor. This allows the the R-74 to be fired as if off the standard P-72-1D/P-72-1DB2 launch rail. The overall length of this configuration will depend on the length of the midcourse section and adaptor sections, but is not significantly greater than the larger Alamo long burn variants. Other configurations are also possible. Performance presents some interesting questions. The heaviest Alamo variants are claimed to have 70 nautical miles of F-pole range, but a digital seeker with a more refined boost-glide trajectory algorithm could add a useful percentage to the range of the basic missile. The later R-73 Archer variants are credited with a range of 21 nautical miles, but this is assuming a launch from a transonic fighter rail, where the missile's motor must impart the energy to get to the peak supersonic speed of the missile. A two stage weapon of the kind discussed by Colonel Medved would launch from a burned out gliding R-27 midcourse vehicle likely to be travelling at Mach 2-3 and with an altitude advantage over the target. Other than the initial impulse required to cleanly separate the terminal stage from the midcourse stage, the launch speed of the R-74 stage would be similar to its design cruise speed. This begs the question of what is not being said here. The optimal rocket motor burn profile for a boosted R-74 Archer would be very different from the standard missile, which has a high impulse but very short burn of mere seconds. The optimal rocket motor burn profile for a boosted R-74 is a slow burn to impart enough thrust to overcome drag at the missile's cruise speed, but sustain that thrust for as long as possible to maximise the missile's endgame G load capability, and make use of the thrust vectoring capability of the airframe. In a sense this is the model pursued by the Israelis with the Python 4/5 airframes, designed to sustain maximum G capability until target impact. The missile is technically feasible. The missile would have competitive range against the MBDA Meteor and much better range than dual pulse AIM-120 variants. The missile would have higher endgame G capability and lethality compared to the standard Archer. The missile would not be significantly heavier than the baseline long burn Alamos, permitting similar warloads on the Flanker. The missile could be introduced very rapidly and with very modest development risk. For comparison, the US is currently developing the NCADE, which uses a two stage arrangement packaged into the AMRAAM form factor, with an AIM-9X seeker and high energy hydroxylammonium nitrate propellant second stage motor. While an air to air derivative of the NCADE would provide excellent range performance compared to baseline AMRAAM models, the terminal stage is built for manoeuvre in the upper stratosphere and is not optimised for maximum tropospheric G performance. A boosted R-74 Archer variant would be far better adapted to killing agile fighter type targets as it is an optimised design. It is certain that the Russian industry is looking at the NCADE program very carefully. Raytheon's NCADE is a two stage Anti Ballistic Missile boost phase interceptor derived from the AIM-120 AMRAAM. The first stage is an AMRAAM motor, the second stage sustainer uses a high energy liquid propellant hydroxylammonium nitrate motor, with a hydroxylammonium nitrate four nozzle control thruster system (Raytheon images). In short, if a program to develop an 'R-74-PD' exists, the BVR missile combat game is yet again about to become more complicated and more lethal. Australian Aviation - September 1986 -Quo Vadis - AMRAAM? NCADE - Network Centric Airborne Defense Element - Raytheon brochure. 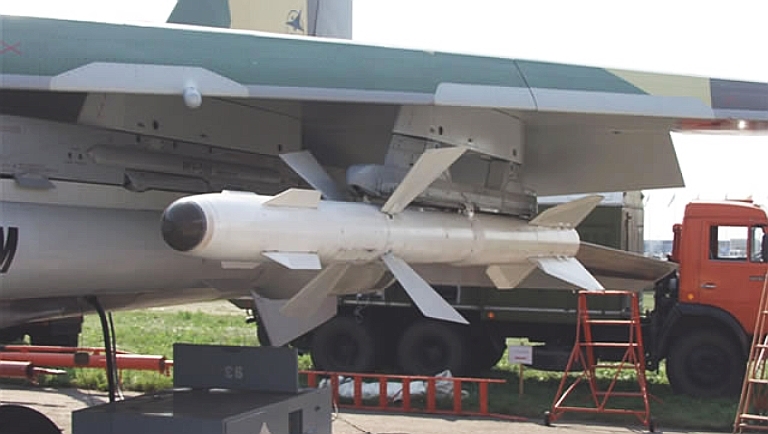 The R-73 is the primary WVR missile currently deployed by operators of Russian fighter aircraft. When introduced during the 1980s it was the most capable WVR missile ever designed. While more recent Western WVR AAMs are often more capable, they are by design at least a decade newer. 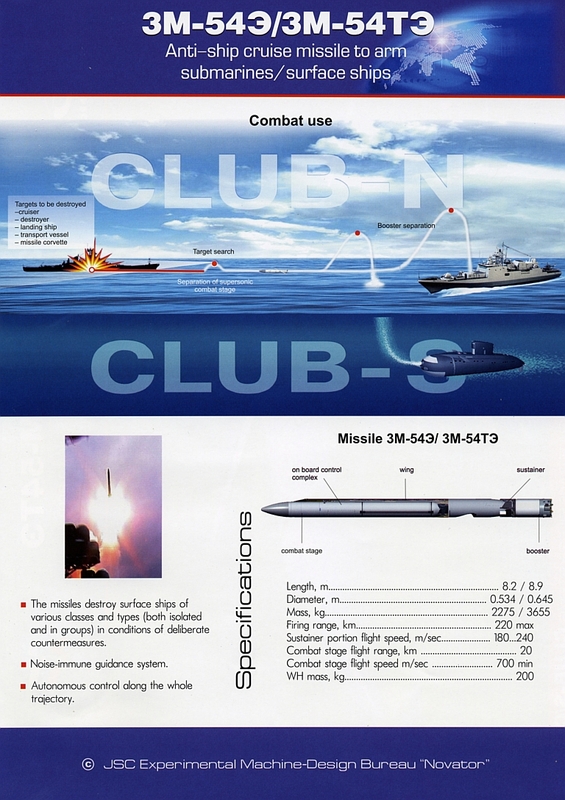 These images show some of the interesting features of this capable family of missiles. R-74E (K-74E) is the reserved designation for a late build variant with a fully digital seeker and guidance system. Baseline Vympel R-73E Archer WVR AAM (Military Parade). Unlike most Western WVR AAMs with thrust vectoring, which employ vanes in the exhaust, the R-73 uses paddles (Military Parade). The MWIR two colour high off-boresight gimballed MK-80M series scanning seekers use a Magnesium Fluoride window (Military Parade). 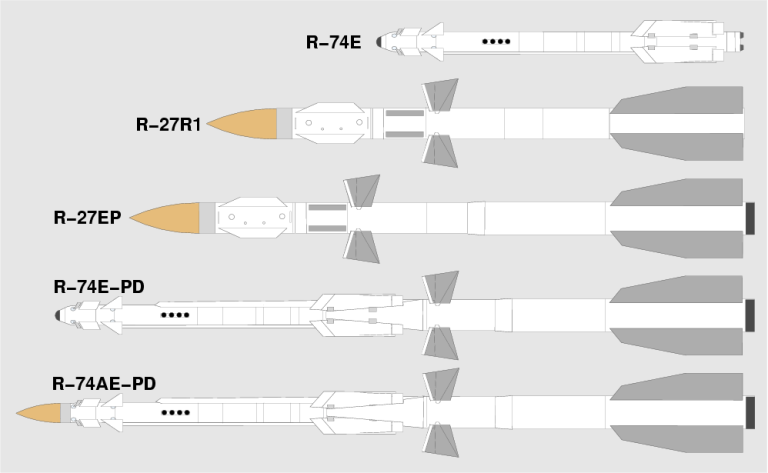 At least one laser fuse design has appeared on R-73 variants in recent years, such missiles are usually designated as the R-73EL. This is evidently a 'four lobe' design with a pair of dual aperture laser transceivers (Military Parade).